Blog Releasing Apache helicopters to Egypt, What has changed? Releasing Apache helicopters to Egypt, What has changed? In October 2013, the US administration refused to send 10 Apache helicopters type AH-64 to Egypt, for the use of counter terrorism operations in the Sinai peninsula. 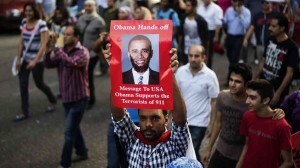 In addition, most US aid to Egypt have been suspended by Obama’s administration. The reason of the US refusal whether for releasing the Apache or for suspending most US aid to Egypt, was not a secret. It was a punishment to Egypt and an attempt to twist Egypt’s arms by the US administration, to express US official’s rejection to the 30th of June revolution and what followed, due to the toppling of the Muslim Brotherhood regime, which was against US plans and interests in the region. On 12/3/2014, Fox news published that Obama’s administration rejected Egypt urgent appeal to release the Apache helicopters. On 13/10/2014, The Egyptian presidency declared that John Kerry, the US secretary of State, informed Marshal Sisi, the president of Egypt, that Washington will release and deliver the Apache to Egypt next month. It’s almost a year and a half now, since the 30th of June revolution. My simple question is: What has changed, that made the US administration change their mind now about Egypt? Isn’t this the same Egypt that is not going on the right path for democracy? Isn’t the same Egyptian military leaders who were sharply criticized by the White house, for what the WH described “Egyptian military violent crackdown against Muslim Brotherhood? This was an official declaration by the US that Egypt’s military leaders are killers and oppressors. But now, Obama didn’t mind to shake the hands and sit down with our “Military Dictator” Marshal Sisi, as they labeled him! Isn’t this the same Egypt that is totally rejected to be compared to the US in all aspects, especially in relation to human rights? Because Egypt dared to address criticism to the US on Ferguson protests and asked the US to deal with protesters in accordance with US and international standards! Isn’t the same Egypt that dared challenging Washington’s orders and made the white house very concerned and disturbed after the Egyptian military’s decision to take the popular 30/6 revolution’s side? Isn’t the same Egypt that is oppressing Muslim Brotherhood and political activists, jailing journalists, As constantly declared by the US department of State, because they believe that Egypt has a corrupted judiciary system? And how dare we have an independent judiciary system? This is totally rejected by US officials that the Egyptian judiciary authority issue provisions or even handle lawsuits against terrorists and spies! Isn’t the same Egypt that is not confronting domestic issues with transparency and not admitting mistakes, like the US is, and the US called Egypt and other countries to do the same and follow the “transparency of the US” in handling own issues? Like Marie Harf, the deputy spokesperson for the US Department of State declared! I know that Marie Harf is just an employee in the US department of State, she is not paid to say her own opinions, but just to say what she gets paid for! But they say if you make the decision that you’re going to lie, you will need to come up with your plausible alternative to the facts. I wish that Marie Harf can really tell us about one single poor time, the US on any official level and at any time, has ever publicly declared that they have committed serious mistakes and crimes against humanity and participated in spreading terrorism and chaos in the Middle East and the world, since the George Bush’s previous administration until Obama’s. Where is the transparency then, Mrs. Harf?! Hey Lady Marie, you don’t even allow us to criticize you when you commit something wrong. But you attack us and accuse us of very serious charges without any evidence or objective logic. Where is the freedom of speech you are chewing Mrs Harf?! I know that there is a big difference between how we, the people feel and wish sometimes, to handle things differently than the politicians and the diplomats are. 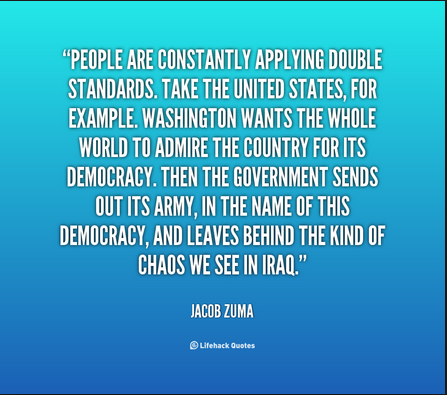 But politics and relations between countries is something, and what we wish to be realized is something else. Politics means mutual interests, whether we like it or not. Of course, Egypt can not isolate itself from the entire world, this is a fact that we must admit. But there is a big difference also between an idiot and reckless president like Bush and Obama, and a president who is very careful in following the street pulse in his country, by putting the interests of his own people in front of his eyes wherever he goes and whatever he says, he knows that he is not just representing himself, but he is representing his people and country, like Marshal Sisi is. Marshal Sisi knows that he gets his power from his own people’s support. Egypt is not doing everything perfectly. Egypt has a long way to go, to really be able to say one day, that we are on the right path in all aspects. We have a lot to learn, a lot to change and a lot to achieve. We have learned a great deal, especially the last 3 years, we need to learn from our mistakes and move forward no matter how hard and challenging it is. We need to change ourselves, before we ask the world around us to change, in the meantime, We also expect from the world to stop this policy of double standards and political hypocrisy. The current Egyptian leadership doesn’t accept dictations, lectures, orders or twisting arms attempts from any country out there. A country’s Dignity can never be measured by a strong economy or how much money or reserves a country has in the state’s treasury reserve. The reason I decided to write this post, is that I wanted to send some messages, especially to the American people and to whom it may concern. This Apache helicopters issue may sounds like just a piece of normal daily news. But to me, it wasn’t. What has changed, is that the Egyptian people are not going to allow Muslim Brotherhood fascist regime to come back to power again. What has not changed, is the US administration hypocrisy, the US administration constant deliberate lies and the white house double standards. When interests speak, you hear those same US officials, who were accusing Egypt yesterday of all kinds of corruption, brutality, oppression, dictatorship, crimes against humanity, military coup, But Today, the tone has changed. Don’t believe Obama when he claims that he represents human values and rights. Don’t believe him when he talks about transparency and justice. Don’t believe him when he talks about democracy and freedom of speech. Don’t believe him when he claims that bigger nations should not be able to bully smaller ones, and that people should be able to choose their own future. 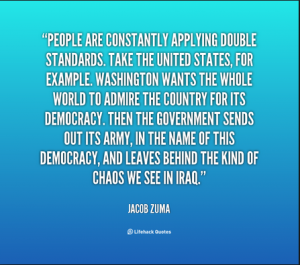 In order to find the truth, you just need to make a simple comparison between Obama’s words, actions and foreign policy. Dear American people, just ask your current president and your previous president, did they collect certified signatures from the Iraqi people for the invasion and destruction of Iraq? Did they make a referendum in Libya and the Libyan people agreed on the invasion of their country? Did they gather official authorization from the dead and the living in Syria to get rid of Al-Assad regime, who disturb their sleep? Please, Look to the enormous destruction, devastation and terror which have spread because of the irresponsible American foreign policy in the middle East. Don’t believe Obama when he claims that the US stands for the Egyptian people’s human rights against oppression and dictatorship. Because when we did revolt against Muslim Brotherhood, Obama thought that cutting his aid will harm Egypt and make Egyptians kneel and ask for forgiveness. Well, we didn’t and we will never will. Real values ​​and principles are indivisible and when double standards interfere with values and principles, know that what you have been told is nothing but lies. History repeats itself. Like the US dealt with 30 years of former president Mubarak, who stepped down on 11/2/2011, all the 30 years of Mubarak were blessed by the States, then all of a sudden, they considered him a dictator and a murderer. The same is happening now, Marshal Sisi was bad, then he is a good guy now and he is ok to deal with. This is the political hypocrisy, I’m talking about. This we can never forget. We can’t just say ok things are fine now. No it’s not ok. Because Obama’s foreign policy and double standards did cost us, precious lives, it did cost blood, pain, suffering, fears, chaos, terrorism and serious threats to Egypt’s national security. It was a horrible nightmare to have a terrorist organization like the Muslim Brotherhood ruling the country with this strange support of the US and the world community. This toppled regime didn’t have any mercy with the Egyptian people, and still is harvesting the lives of innocents in Egypt. This is the US administration that is considering a group as “terrorists” in one area, and “freedom fighters” in another. Blessing a revolution in a country, and consider it a military coup in another. Describing terrorists as political opponents, calling terror attacks and violent armed protests as “peaceful gathering”. Financing and arming killers and mercenaries to slaughter people and cut their chests and eat their organs, and they call them the “Syrian liberation army”. As long as the US doesn’t declare Muslim Brotherhood as a “terrorist organization”, nothing is fine, and nothing has changed, except that the US interests now necessitate to have a different foreign policy towards Egypt, at least for now. Next time the Americans are going to vote for their future president, I hope they put into their consideration, that they are not chosing just a president for the US, but they are also going to chose the man who will represent one of the superior countries in the world, which means, he will either help spreading peace in the world, or he will participate a great deal in destroying the world.